February 27 (Proactive Investors) Kincora Copper (CVE:KCC) has hired the former boss of the giant Oyu Tolgoi copper mine in Mongolia to its advisory board. Cameron McRae, who was until recently the president and chief executive of Oyu Tolgoi, the operating company behind the Rio Tinto-backed mine, joins Kincora to help with stakeholder relations, including with the government. He was also Rio Tinto's (LON:RIO) country director for Mongolia, having been involved in the merger to create the mining giant. It follows some highly encouraging results from the company's flagship Bronze Fox copper exploration project, just down the road from Oyu Tolgoi. The company will grant McRae options to buy up to 725,000 Kincora shares on or before 27 February 2018 at a price of C$0.105 a share. Sam Spring, President and CEO of Kincora, said: "We are very excited to have Cameron join us and being able to benefit from his extensive experience, relationships and networks in the industry, particularly those built overseeing Oyu Tolgoi, the largest single mining investment project in northeast Asia, and in his recently appointed positions. "We believe Cameron will complement our existing teams skill set, in-country networks and proactively add-value as we look to advance our Bronze Fox copper project." Shares in the company have risen 160% so far this year to C$0.0650. Ulaanbaatar, February 27 (MONTSAME) At the Stock Exchange trades held Thursday, a total of 101 thousand and 565 shares of 24 JSCs were traded costing MNT 64 million 064 thousand and 565.96. "State Department Store" /52 thousand and 779 units/, "Remikon" /40 thousand and 744 units/, "Khokh gan" /2,200 units/, "APU" /1,100 units/ and "E-trans logistics" /1,100 units/ were the most actively traded in terms of trading volume, in terms of trading value--"State Department Store" (MNT 30 million 597 thousand and 320), "Remikon" (MNT six million 113 thousand and 600), "Bayangol hotel" (MNT five million and 074 thousand), "APU" (MNT four million 640 thousand and 797) and "Gobi" (MNT three million 962 thousand and 600). The total market capitalization was set at MNT one trillion 662 billion 766 million 037 thousand and 521. The Index of Top-20 JSCs was 16,476.00, decreasing by MNT 55.44 or 0.34% against the previous day. 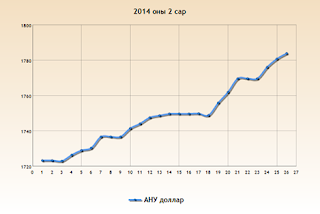 February 27 (business-mongolia.com) Mongolian tugrik has been depreciating against USD for the last year. 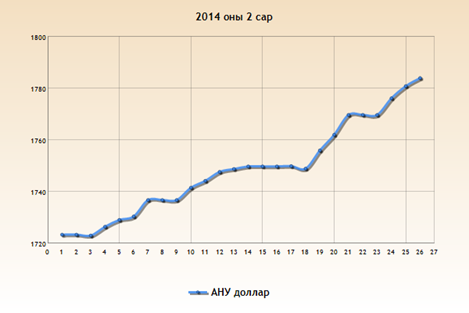 Then, this week it reached the record high of 1800 MNT per USD comparing to 1350MNT a year ago. President of the Bank of Mongolia N.Zoljargal briefed the press on currency volatility, monetary policy and overall economy of the country. He stated that for the last 5 years the trade balance has been in deficit, and coal price has been weak, which is the main export commodity made the country's domestic currency to depreciate. However, coal price is tending to rise and foreign investment has started becoming positive, he added. 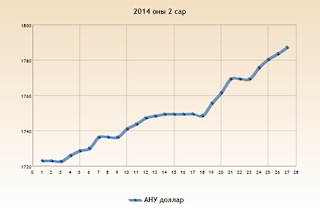 First 2 months of this year, Mongolia received FDI of USD280 million. According to N.Zoljargal, trade balance has been balanced for the first time in years, and the bank believes that MNT1700 per USD is a suitable number for trade balance. The gold commissioning to the bank has risen from 500 kg to 1300 kg comparing to the same date last year. The amount of gold will be sufficient to what we are losing from coal. The Prime Minister added that currency appreciation does not only depend on the central bank, also it depends on private sector, "We must produce domestically" he emphasized. In the end of the meeting N.Zoljargal concluded that the bank has enough foreign currency reserves and it has all the tools it needs to maintain the current rate. Ulaanbaatar, February 27 (MONTSAME) The Prime Minister N.Altankhuyag Wednesday paid a working visit to northern Orkhon province. The visit began with a meeting with local business people. The sides talked about a recently-announced industrialization project of the Government and how to support the local small and medium enterprises. After that, the Premier met with employees of the Erdenet Mining Corporation, a joint Mongolian-Russian venture, to learn its 2013's achievements and the 2014's plans. He was said that the venture last year put forward a call for saving and reducing operational expenses by 2-3 million USD and earned it mainly from reduced prices of heavy machinery wheels. The venture has been taking measures to constrain money flow abroad as well. In 2014, Erdenet has planned to make procurement for 13 types of products amounting 40.3 billion togrog. Mr Altankhuyag praised the plant for its support to domestic production and transparent procurement and regarded these efforts as great advantages. Thanks to the Corporation's initiative, a project gas launched for a regional diagnosis center with a capacity to receive 500 people a day. If the Government funds the project as required, it can come to service in 2015, said officials. The same day, the PM and accompanying him delegation visited a construction site of one thousand apartments, which has been planned by a consortium of 14 domestic building companies. After receiving the needed accreditation from authorities, the construction will start this April. Ulaanbaatar, February 27 (MONTSAME) A Mongolian delegation led by Mining Minister D.Gankhuyag is to attend the PDAC International Convention that will run in Toronto, Canada, this March 2-5. During the Prospectors and Developers Association of Canada (PDAC) International Convention, Trade Show and Investors Exchange, the Minister will deliver a presentation themed "Mining policies of the Government of Mongolia, investments, legal environment competitiveness, stabilization measures". He will also advise on relevant documents effective in Mongolia, including sate policy on the minerals sphere, investments law and the minerals law. Mr Gankhuyag intends to meet with Mr Ed Fast, Minister of International Trade, Mr Joe Oliver, Minister of Natural Resources of Canada and also with representatives of leading in the world mining corporations. Toronto's four-day annual Convention has grown in size, stature and influence since it began in 1932, today it is the event of choice for the world's mineral industry. In addition to meeting over 1,000 exhibitors, 30,147 attendees from 126 countries, it allows participants an opportunity to attend technical sessions, short courses as well as social and networking events. February 27 (infomongolia.com) On February 26, 2014, the Ministry of Justice and International Finance Corporation (IFC) have established the Memorandum of Understanding on Cooperation for 2014-2019, where the Ministry was represented by State Secretary J.Bayartsetseg and the IFC by Resident Representative Tuyen Nguyen. In Mongolia, the demand of property registration is required on estate and intangible assets, such as shares, securities, claims, accounts receivables and intellectual property as collateral to support them through the economic circulation problems, where small and medium enterprises could increase the capacity of collateral, which is a need to create a system of property registration. Thus, the legislation regulates the development and introduction of an electronic system has been focused by the Ministry of Justice. The Ministry as part of the estate and intangible property collateral for regulating the legal framework for the development and introduction of electronic registration system is to cooperate with the International Finance Corporation. So that property and intangible assets, the economic cycle improves. Also, the registration mechanism can quickly and immovable property and rights centralized collateral registry into an electronic database, and that property rights are valid collateral for public information, the disclosure of information, and many other positive results would outcome. February 5 (Mongolian Economy) Mongolia's leading female politician Minister of Environment and Green Development Sanjaasurengiin Oyun was included in the 100 Global Inspirational - Women in Mining list by the British organization Women in Mining (WIM). According to the organization's Chairwoman Amanda Van Dyke, "The mining industry had fewer women on its boards and in its senior executive positions than any other major global industry, and by a considerable margin." "Those we selected stand out in a number of ways", said Van Dyke continues in her foreword while explaining how difficult it was to choose those named on the list. "They have a lasting impact on the industry. They support other women in mining, and the communities and environments impacted by the industry. We wanted to make sure that regardless of career stage, discipline or jurisdiction, the end result also encapsulated how diverse and high achieving women in our industry are." Oyun was the only Mongolian to make the list, said Van Dyke, highlighting her achievements in the mining industry as an employee and in government. Most of the women who made the list have had at least 20 years' experience in mining. Many women were noted for their work in NGOs to support women in mining, the rights of mine employees, supporting legislature concerning flexible work hours, supporting the local communities residing nearby mines and assisting women who planned to work in the mining industry. February 27 (infomongolia.com) On February 26, 2014, the Ministry of Mining of Mongolia hosted the regular press conference themed "Transparent Mining", where Minister Davaajav GANKHUYAG and State Secretary at Mining Ministry Rentsendoo JIGJID reported on current mining situation in the country. In their statements authorities underlined the recently successfully organized "2014 Coal Mongolia" last week, where about a thousand guests from 8 countries have participated. Further stated, Mongolia's geological reserve for coal estimates at 175.5 billion tons of which 26.8 billion tons are approved and with its coal reserve, Mongolia stands in the top 10 in the world. During the 4th International Coal Investors Conference, the vital problems facing were discussed including Infrastructure: Expenses on transportation and logistics are high; Insufficient capacity of border crossing, unclear issues on transit and transportation tariffs, and much bureaucracy at border. Price: The extracted coal is not sold at international market price, besides the product does not meet international standards on its classification and process; decreased number of consumers and weak competitiveness, moreover a general policy on price does not exist, where local entities compete with each other that cause to drop the coal price; Mineral Resources Stock Market is not established yet in Mongolia. Taxes: There are a lot of types of tax. From 2014, the Ministry of Mining in collaboration with affiliated organs and international bodies are developing "Coal" Program in the frames of "From Big Government to Smart Government" policy. The first stage of the "Coal" Program will be implemented in 2014-2018, the second in 2019-2025 and in the scope of the Program, it anticipates the coal exploration, output and reserve would be increased. Also, the coal export will be regulated under "One Window" policy; methane processing plants based on coal will be erected that would help to reduce air pollution in urban areas; To provide local demand by extracting syngas and liquid fuel from thermal coal; To create transit transportation corridor, setting up tariff prices that would reduce logistic expenses. The project to extract syngas by processing thermal coal is planned to be implemented in 2017 and in the near future it expects to export 100-130 million tons of coal annually. Mongolian delegates led by Mining Minister will be participating in the Prospectors & Developers Association of Canada (PDAC) International Convention to take place in Toronto, Canada on March 02-05, 2014, where officials will introduce the Government Policy on Mining and its current measures being carried out. During the event, Minister D.Gankhuyag will have bilateral talks with the Minister of International Trade of Canada Ed Fast. In January 2014, Mongolia's copper concentrate output estimates at 85.1 thousand tons, molybdenum at 397.0 thousand tons, coal 1.4 million tons, where tax income at 5.37 billion MNT. Also, a total 420 kg of gold was mined in January and following the enactment of the new law on royalty payment on gold, the volume of gold delivered to Mongol Bank (Central Bank of Mongolia) is increased obviously. In January-February of 2014, a total of 1,320 kg was commissioned to the Bank, which is a six-fold greater than January and February of 2012 combined and two-times than January-February of 2013 respectively. The other most interested issue was Mongolia's debt to Chalco and Minister D.Gankhuyag affirmed the debt would be covered by end of the first half of this year. He further clarified that the Erdenes Tavan Tolgoi JSC representing the Government of Mongolia first borrowed from China's state-owned Chalco (Aluminum Corporation of China) 250 million USD in November 2011 under the agreement to pay off by coal within March 31, 2013, and another 100 million USD in May 2012 to repay by July 01, 2013. But following some circumstances such as coal price drops, we could not cover the debt on time and as of today about 148 million USD is left so far. Preliminary, it expects to cover 90 million USD on April 01, 2014 by 1.5 million tons of coal and the rest money by 1 million ton coal in April and May of this year. Feb 27 (Reuters) - German rail technology provider Vossloh won a contract to supply fastening systems for 270 kilometres (168 miles) of rail lines in Mongolia, its first from the Asian country. The contract is worth only 20 million euros ($27 million), Vossloh said on Thursday, but added that it hopes it will be the first of many contracts from Mongolia, which is planning new rail lines with a total length of 5,500 kilometres in the coming years. Delivery of fastening systems for the route connecting Mongolia's massive Tavan Tolgoi coal mine with the Chinese border will begin in a few weeks and be completed in the first half of 2015. February 27 (UB Post) Two years ago, over 300 special Anti-Corruption Agency officers apprehended former president N.Enkhbayar after he came home, for an arrest based on corruption charges. At dawn, black-masked officers entered his home and carried him outside, holding him in the air by his legs and arms and taking him to prison. At that time, everyone saw only his two feet sticking up in the air wearing Made in Mongolia socks. From this appearance, the socks became famous and their sales increased. When the owner of this sock company, D.Lkhagvajav, was a child wearing Russian socks, his father wore long white strips of cotton to wrap his feet or Chinese socks. His grandfather wore hand-knit socks made by his grandmother. Now he is over 40 years old and wears his Made in Mongolia socks. Almost every Mongolian household has at least one family member who wears his socks made from camel wool. D.Lkagvajav lived in South Korea for eight years. When he was there, he learned about factories. He wasn't able to make a large investment, all his savings were only 50 thousand USD, but he saw that a sock factory could be appropriate and calculated that socks could be made inexpensively. When he returned to Mongolia, he brought with him two knitting machines and some related items for the price of 20 thousand USD. After that, he faced troubles buying land to build a factory. He needed to be connected to electricity, and for that he had to go to the three or five state organizations and wait a long time. He was the owner of a medium sized enterprise that needed to connect to a 380 volt power source and some people wait one or two years for approval. According to him, this is a failure of government agency services and only the state can release new regulations. When a businessman can assemble all of their documents they can connect to 380 volts. This is how the government supports businessmen. The second challenge he faced was that a resident of Mongolia cannot build a factory on their private land. But most Mongolians build their factories on their land, even though it is forbidden by law. He is charged two million MNT every year for using private land for non-designated use. He believes that if the state released new regulations that allow residents to build factories on their private land, it would be easier for businesses. The third challenge was human resources. When he transported several containers from South Korea in 2005, he called all his relatives and 28 people came to help him. He says, "Now when I transport containers again, when I call them, everyone says they are busy and can't come to me. I see that people have no free time and work hard to reach for their dreams." Generally, the founders of small and medium sized businesses need to work as a custodian, accountant, director, and human resources manager. As for D.Lkhagvajav, he thinks about Japanese human resource policy, like directors giving their employees six months for vacation, and during this time they can enroll in training and professional experience at their leisure. After this time has passed, he can push them to work harder and his employees can gain professional development training. He says, "Actually, when I went to South Korea, I did not understand very well. They seemed like they were working pretty hard, and for a while I followed the traditions and livelihood. After I understood that they were adhering to a strict policy. There, if someone does not work for one day, they can face bankruptcy. Every Korean lives in that kind of business environment, they don't have any chances to sit back from work or spend time at other entertaining events. As for Mongolians, they are very different. If someone has not earned money for a whole month, that person still has fancy clothes and walks with a smile on the street." Now, we are wearing 50 percent imported socks and the other half are made in Mongolia. Sock factories import 90 percent of their raw material from South Korea and 10 percent from China. Basically, they have an opportunity to produce domestically. But first they are planning to produce yarn designated for sock making material. Mongolia has rich wool resources, and can produce wool yarn. As for the cotton, South Korea does not produce it and foreign countries import yarn from others, like us. That's why producing yarn is so expensive. Chinese factories produce fake socks that look like famous factory brands. In Narantuul Market people sell these fake socks for 2,500 MNT, two times cheaper than original, Mongolian socks made from camel wool. It is impossible to control the sale of these fake socks and it may be a long time before the black market is shut down. Business is competition, his company does not put out regular advertisements, it depends on its policy of only producing high quality socks. The quality is their advertisement, and they think there's no need to spend money on announcements or television ads. But people only know the quality of their products when they wear them, or when they see famous Mongolians wearing them on international news. D.Lkhagvajav's factory only can fix small problems, but not big ones. He still needs designers to meet his human resource needs. Most sock factory managers believe that in 30 or 40 years Mongolia will be able to fully meet the needs of its national sock consumption. February 27 (UB Post) The state has prohibited travels of all transportation with less than five tons of load from Bagakhangai District of Ulaanbaatar to Sainshand and Zamyn-Uud soums in Dornogovi Province as they are currently focus areas of foot and mouth disease. As of Wednesday, over 2,900 cattle were diagnosed with foot and mouth disease in 12 soums of Sukhbaatar, Khentii and Dornogovi Provinces and almost all of them have been slaughtered since the outbreak in Ongon soum of Sukhbaatat Province on January 27. A total of 2,202,086 livestock were injected with vaccines nationwide. Currently, 1,425 officials with 285 vehicles are operating at the focus areas to vaccinate livestock and ensure strict quarantine. Recently, 14 people were fined for intending to enter Ulaanbaatar while carrying meat for sale from provinces. They were caught at Kherlen Auto Checkpoint in Baganuur District. All the checkpoints in the city are currently inspecting all vehicles passing into the city and sanitizing their tires and covers to prevent infection of the disease in Ulaanbaatar. As of Wednesday, checkpoints inspected 3,492 vehicles, 8,624 passengers and confiscated 365 livestock and 34 tons of meat that had no certificate of origin. In total, 14 people were fined for bringing unauthorized livestock and meat to the city. By M.ZOLJARGAL, February 27 (UB Post) Early this week, Border Intelligence Division (BID) officials of the General Authority for Border Protection caught a Mongolian woman at Zamyn-Uud soum auto checkpoint carrying historically significant artifacts and goods with the intent to smuggle them to China. The found artifacts were mostly dedicated to Buddhist religious rites and customs. There were ceramic and brass Buddhist gods, horns, bells, lamp cups and a Bronze Age knife used for religious purposes. A Mongolian traditional knife, tobacco pipe, twin green jade snuff bottles and meteor debris were also found. According to a source within the Authority Against Organized Crimes of Mongolia (AAOCM), border guards themselves might have been conspiring with the smugglers and trying to smuggle the artifacts across the border. The packages with smuggled artifacts were stamped, which indicated that they were checked by border guards. The preliminary investigation revealed that a Chinese man who lives in Mongolia collects all the artifacts and smuggles them through the Mongolian border checkpoint to China with the assistance of the female Mongolian suspect. The total value of the recovered artifacts will be assessed shortly. BID received an anonymous report about the planned smuggling and apprehended the suspect. The officials were collecting documents related to antique smugglers when they received the report, according to Unuudur Daily Newspaper. According to what law enforcement organizations discovered, Chinese citizens in Mongolia meet and deal with province residents and offer specific amounts of money in return for providing antiques. The Chinese collect information about very rare artifacts all over Mongolia and let Mongolians collect them, reported Unuudur. Legal organizations have also received a report that a gang of plunderers are traveling in the provinces and robbing tombs and burial mounds on the order of Chinese nationals. The collected artifacts are smuggled across the Mongolian border and are mostly sold at antique shops in Erenhot, China. Mongolian artifacts make up over 80 percent of the items for sale at Erenhot antique shops. According to a source within the AAOCM, there are several gangs of Mongolian smugglers, and Chinese people choose the most valuable artifacts from what the Mongolians are selling, like a normal trade. The source also noted that there are specific groups of Mongolians who smuggle the chosen artifacts through the Mongolian checkpoints to China. During interrogations, officials also learned that many valuable sutras and treatises have been smuggled to China. A source from the General Police Department said that the smuggling methods of smugglers are getting more advanced day by day and more difficult to catch. The source commented that the department is trying its very best to combat collusion by police and border guards who are violating their oaths by conspiring with smugglers and giving away rare and valuable cultural artifacts for personal gain. When the investigation and cost assessment is complete, all the detained artifacts will be delivered to museums for display. February 27 (UB Post) The Mongolian national team will leave for Sochi on March 2 for the Winter 11th Paralympics. Skier B.Ganbold is representing Mongolia at the Sochi 2014 Winter Paralympics. National team's coach J.Dashdondog said, "Two years ago, I first met B.Ganbold at an athletics competition. I introduced him to skiing and couched him myself. I have coached many athletes but some of them were discouraged. But B.Ganbold has more endurance than other athletes. Skiing is a sport of endurance." Mongolian athletes previously participated in the Winter Paralympics in 2006 and 2010. Below is an interview with skier B.Ganbold who will represent Mongolia at the Sochi 2014 Winter Paralympics. -When did you begin skiing? -I've been skiing for two years. I gained the right to compete at the Paralympics from the USA Open Championship-2014. I got silver from the USA Open and placed 18th at the World Championship. This will be the first time I'm competing in the Paralympics. I will compete in three distances on March 10, 12 and 16. -How did you prepare for the Sochi-2014 Winter Paralympics? -I prepared at an army resort for six month and also at Gavjinshand resort for a week. I focused on preparing for the sharp left turn near the finish line and also there is a sharp right turn in midway. -Mongolian athletes who competed at the Sochi 2014 Winter Olympics mentioned that the weather was bad. Have you taken this into account? -I know about the bad conditions as I have competed in the World Cup Series on March 2013 at Sochi. February 27 (UB Post) Mongolia is home to about 218,700 elderly who are receiving a senior pension. According to reported data, 800 to 900 billion MNT is spent annually on pensions. The Mongolian Government spent an additional 90 billion MNT to increase senior pensions by 20 to 27 thousand MNT, this year. However, elders weren't pleased with this decision, because they were expecting to see an increase of 15 to 30 percent. The Ministry of Population Development and Social Welfare organized a meeting "Issues about Reform of the Pension System" in order to develop understanding and to resolve questions about the changes, on February 25. The Mongolian pension fund is financed by commission revenue. The deficit of the pension fund represents two percent of today's GDP, but if the system continues functioning like this, the losses to the pension fund will increase. It could grow to seven percent of GDP by 2030, and 10 percent by 2040, according to forecasts by international researchers working with the World Bank. The researchers say, "This study shows that a reform of the pension fund is required." While the pension fund is experiencing loss, the number of seniors who will be eligible to receive retirement pensions in the future is steadily increasing along with population growth. Nevertheless, pensions will be twice as low in the future compared to what is presently available. To stabilize this loss the Mongolian Government needs to raise the retirement age, close the gap in the retirement age between men and women, increase pension fees, and lower the amount of monthly pensions, as suggested by international institutions. Some officials say, "The average age of retirement for a pensioner is 67 in most other countries. In Mongolia, workers retire earlier, considering professional identities and working conditions such as the military and arts. Early retirement increases the costs to pension insurance funds. Thus, if you want to earn a higher pension, you need to prolong your retirement age. By doing this, accumulation will generate and the revenue of pension insurance will be increased." These are the controversial changes that will be made to the system. Today, the average life expectancy of Mongolians is 67, so one day you can retire and the next day you can die. These days 40 year-olds are struggling to find jobs, so where and what will 60 year-old elders do? Instead of leaving their livelihoods to chance, it would be better to provide the legal conditions for seniors to continue working, even after they reach retirement age. And it's better to increase the retirement age of those who work in the military and the arts. In a country like Mongolia with extreme weather, it makes sense to retire early. Nowadays, when it's hard for even a young man to find a job, people are looking to the Mongolian Government to take care of its citizens. But the Mongolian Government sees its citizens as a tool to increase pension insurance funds. People have expressed their opinions about the changes, suggesting that there are many ways to increase the pension fund. They suggest that high ranking officials in government limit their luxury consumption. Mongolians understand but are shocked by a global average retirement age of 67 in contrast to the Mongolian average life expectancy of 67. If the average life expectancy of Mongolians was over 80, like in highly developed countries, perhaps it would be another story. We are pleased to inform you that “Oil and Oil Shale Mongolia 2014” an international investment conference on oil and oil shale, which is hosted by Petroleum Authority of Mongolia, will be held in Ulaanbaatar on 9-10 April 2014. 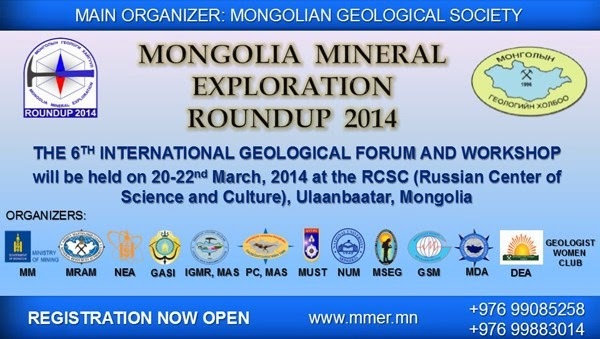 Minex Mongolia Co., Ltd. is serving as the main organizer of the event. This is the country's first international investment conference on oil, gas, and oil shale. The event will be attended by international investors, oil, gas, and oil shale companies, service providers, consultancies, equipment suppliers, and traders. The delegates will have a unique opportunity to network with industry's key contacts and to obtain vital information on legislation and policies on oil, gas, and oil shale exploration and production regulations from the officials of the Ministry of Mining and Petroleum Authority of Mongolia. Moreover, projects on oil refinery, exploration, production, plus oil shale projects will be presented. Attending the Oil & Oil Shale Mongolia 2014 International Investment Conference will let you accurately assess how you could reap the rewards of Mongolia’s growth, evermore favorable policies, and emerging market of oil and oil shale. Whether you are seeking new and exciting investment opportunities, or in pursuit of investment for your Mongolian projects, the conference is your ideal chance to meet, hear from and network with senior players in Mongolian business and government. The country has recently revised its investment legislation with a view to make the investment environment more favorable and stable for investors. A draft of new oil exploration and production legislation is currently in parliamentary discussion and scheduled to be adopted by March 2014. If there is anything we can be helpful with, please contact us via this email or phone: (976) 99105877; 99091765. Thank you for your consideration. We look forward to welcoming you to the event. Ulaanbaatar, Mongolia, February 27 -- (Cover Mongolia) – Cover Mongolia is pleased to announce that it has been selected as a Media Partner to Oil & Oil Shale Mongolia 2014, the first ever investor conference dedicated to the oil and the newly emerging oil shale sector in Mongolia. This follows Cover Mongolia’s successful partnerships with Coal Mongolia 2014 and Metals Mongolia 2013 international conferences. 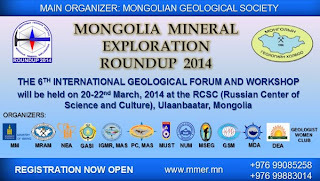 Oil & Oil Shale Mongolia 2014 is hosted by the Petroleum Authority of Mongolia and organized by Minex Mongolia LLC in Ulaanbaatar, Mongolia on April 9-10, 2014 at the Best Western Premier Tuushin Hotel. Find out more at oilmongolia.com. By David Yong, February 21 (Bloomberg News) Mirae Asset Management Co. is avoiding junk bonds of Mongolian Mining Corp. (975) in the absence of a rebound in coal prices, as Moody's Investors Service says any so-called distressed exchange would add to downgrade risks. The company's 8.875 percent notes due March 2017 have declined 11 percent this year, bringing losses to 17 percent since the bonds were sold in March 2012. The debt, sold to investors at par, traded at about 69 cents on the dollar to yield 23.5 percent yesterday, Bloomberg-compiled prices show. Moody's lowered its long-term rating on Mongolian Mining to Caa2 in November, its fourth-lowest junk grade, while Standard & Poor's cut to its fifth-lowest level of CCC+ this month. MMC lost money last year thanks to a three-year slump in benchmark coking coal prices, which reached a record-low on Feb. 5. The Ulaanbaatar-based, Hong Kong-listed miner is raising cash by selling assets and seeking to roll forward some loans as it faces $277 million of debt-servicing obligations this year, Moody's said in a Feb. 17 statement. "The company has to settle its loans coming due before they get to a distressed situation," said Kim Jin Ha, a money manager in Seoul at Mirae. "We'll only get back in after some positive signs, no matter where the bonds are trading at. We'll wait for a clear improvement before we can say 70 cents is good value." Mirae, which manages about $59 billion, sold its remaining holdings of Mongolian Mining's 2017 notes last quarter at a small loss, Kim said in an e-mail interview earlier this week. MMC's debt maturities include $105 million in promissory notes, the amortization of $102 million in bank loans and about $70 million in interest payments, according to Moody's. Further downgrade pressure could emerge if Mongolian Mining fails to defer maturing debt on a timely basis, reorganizes debt in a distressed exchange and coking coal prices remain depressed, Moody's said. A distressed exchange is a restructuring strategy by an ailing firm to avert bankruptcy by proposing to alter the contractual relationship between a debtor and various classes of creditors. CreditSights Inc. placed an 'underperform' recommendation on the 2017 bonds in a Feb. 13 report, given the company's "critical" financial woes. The miner produced 9.7 million metric tonnes of coking coal in 2013, meeting 79 percent of guidance, the research firm said in a separate January report. MMC raised $90.3 million selling its Ukhaa Khudag-Gashuun Sukhait road assets to state-owned Erdenes MGL LLC on Feb. 13, according to a Hong Kong exchange filing. That will ease short-term liquidity strain, Moody's said. The miner hasn't provided any update about a potential equity injection from existing or new shareholders, according to Simon Wong, the lead analyst in Hong Kong at Moody's. Coking coal needs to be sustained above $150 a tonne for the miner to generate positive cash flows before attracting new investors, he said. "The government has relaxed and tightened its foreign investment law in an unpredictable manner in the past few years," Wong said by phone yesterday. "That has created some uncertainty for potential investors." February 27 -- Guildford Coal Limited (ASX: GUF) is pleased to announce the appointment of Mr. Michael Majendie to the position of Chief Financial Officer. Michael is a member of the Institute of Chartered Accountants and holds a Certificate in Applied Finance and Investment. February 26 -- This Interim Management Statement by Origo Partners Plc ("Origo" or the "Company," LON:OPP) and its subsidiaries (the "Group") relates to the three month period from October 1, 2013 to December 31, 2013 (the "Period"). Ulaanbaatar, February 26 (MONTSAME) At the Stock Exchange trades held Wednesday, a total of 40 thousand and 121 shares of 21 JSCs were traded costing MNT 34 million 005 thousand and 502.00. "Remikon" /24 thousand units/, "Hermes center" /6,201 units/, "Nako tulsh" /2,320 units/, "Genco tour bureau" /1,795 units/ and "Material impex" /1,290 units/ were the most actively traded in terms of trading volume, in terms of trading value--"Material impex" (MNT 17 million 427 thousand and 900), "APU" (MNT four million 021 thousand and 400), "Remikon" (MNT three million 614 thousand and 850), "Gobi" (MNT three million 282 thousand and 475) and "Hermes center" (MNT 985 thousand and 909). The total market capitalization was set at MNT one trillion 679 billion 774 million 022 thousand and 803. The Index of Top-20 JSCs was 16,531.44, decreasing by MNT 419.00 or 2.47% against the previous day. February 26 (Bank of Mongolia) Auction for 10 years maturity Government Bond was announced at face value of 10 billion MNT and each unit was worth 1 million MNT. Face value of 10.0 billion /out of 10.0 billion bid/ Government Treasury bill was sold to the banks at premium price and with weighted average yield of 14.25%. February 26 (Bank of Mongolia) Regular auction for 52 weeks maturity Government Treasury bill was announced at face value of 20.0 billion MNT and each unit was worth 1 million MNT. Face value of 20.0 billion /out of 24.0 billion bid/ Government Treasury bill was sold to the banks at discounted price and with weighted average yield of 11.19%. February 13 (Cover Mongolia) As of February 13, ₮486.5 billion (₮482.4 billion as of February 13) existing mortgages of 17,222 citizens (17,105 as of February 13) were refinanced at 8% out of ₮844.8 billion (₮844.3 billion as of February 13) worth requests. Also, ₮891.5 billion (₮848.3 billion as of February 13) new mortgages of 15,748 citizens (14,868 citizens as of February 13) were issued at new rates out of ₮925.5 billion (₮919.9 billion as of February 13) worth requests. Mogi: this must be a joke. Ulaanbaatar, February 26 (MONTSAME) In the first week of 2014, the foreign direct investments (FDI) increased by 26%, says Mongol Bank. 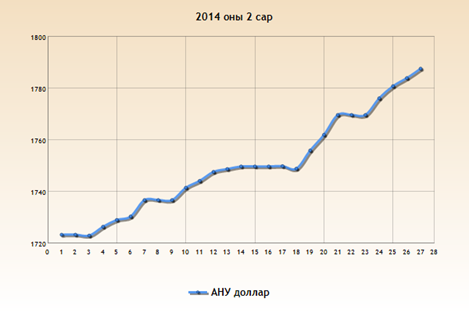 The increase happened thanks to increase of 22% in mining investment and of 42% in others (non-mining investments). According to Mongol Bank, other positive performances have been observed in currency flows, as the foreign currency supply into the Mongolian economy increased by 17%, while money flow abroad fell by 4% in 2014. February 26 (infomongolia.com) On Tuesday, February 25, Minister of Economic Development N.Batbayar, Minister of Mining D.Gankhuyag and Governor of Central Bank N.Zoljargal met with representatives of gold miners at the Ministry of Economic Development. In order to keep economic progress in 2014, Mongolia aims to extract 1 million ton of copper concentrate, 1 million ton of crude oil, 1 million ounce of gold or 31 tons, 10 million tons of iron ore and 30 million tons of coal within the year. Officials deem by extracting and exporting above mentioned mine products in 2014, monetary reserves would be increased and slow down currency fluctuation, besides would impact positively to economic growth, henceforth Ministries pledged to implement above tasks in collaboration with affiliated organs, agencies and private sectors. In January of this year, the Government of Mongolia eased the royalty payment on gold from 10 to 2.5% and today's gold mining in the country estimates at 8.9 tons that shows an increased volume compare to previous years. In order to reach the 31 tons of gold exploration plan in 2014, officials requested from gold miners to deliver their preliminary estimations and based on feasibility studies, 11.4 tons of gold is expected to explore by about 30 companies and another 20 tons by Oyu Tolgoi and Boroo Gold companies. In 2013, the Government adhered to a policy to support construction sector by allocating 2.7 billion USD to promote mortgage loans and as a result, a total 40 thousand citizens have applied for this loan to date, notes Governor N.Zoljargal. So, in 2014, the Government aims to support gold sector, where the gold miners request a finance of 160 billion MNT and this fund to allocate is not a problem, only well prepared studies and prompt activities are required, says Minister N.Batbayar. Afterwards, representatives of gold companies, Central and commercial banks, and Ministries and Agencies agreed to form a joint working group to implement above tasks. Since January 2014, Mongolia's export volume on mining products except for gold shows decreased rate. This tendency would be continued throughout the year, say experts. However, it preliminary estimates the world economy would not grow much this year compare to 2013 statistics, but Mongolia kept its economic growth in two-digit numbers last year and it showed 11.7%, where Chinggis bond affected impetus role to stand in top 5 economies of the world. Therefore, officials underline in order to keep going, gold sectors' role is much and state and private sectors should work more closely to accomplish above works. The Mongolia Sales Managers' Index brings together the collective wisdom of Sales Managers throughout Mongolia to produce the earliest source of understanding about what's really happening in one of the most dynamic countries in the world. The Headline Index is designed to reflect overall economic growth, bringing together the average movement of Confidence, Market Expansion, Product Sales, Prices Charged and the Staffing Indices. Key sectors of the Mongolian economy are frequently forced to reduce output and staffing levels during the winter months. Panellists in February have explained that this month has seen exceptionally harsh weather conditions, further affecting economic development. Confidence among Sales Managers is still low, registering under the 50 mark. However, the rate of decline is falling, and is now close to the "neither growth nor decline" level. However Panellists have explained they feel the coming months may see developments that will improve confidence. The Market Growth index reflects growth of the general marketplace in panellists' own industry sectors. Sales Managers' report that the overall speed and direction of economic growth has begun to fall after unusually difficult weather conditions in February. The key mining and constructions sectors have been hit particularly hard, experiencing a month of declining market growth. However non-manufacturing sectors have seen modest economic growth over the past month. The Product Sales Index reflects the sales of individual companies rather than the wider economy. The Index has continued to decline rapidly, falling to 40.0 in February. Panellists have suggested that problems with investment in the key mining sector, challenging seasonal conditions and the high cost of importing goods have contributed to falling sales. The Prices Charged Index registered 61.7 in February which marks a decrease from last month but still reflects rapidly increasing prices. The Index suggests Sales Managers are still passing on large price increases to business and consumers albeit at a slowing rate. Panellists noted that the decline in value of the Tugrik and general inflation appears to have stabilised. Although the high cost of importing goods (in particular petrol) is still the main cause of price rises. Managers are recruiting staff to meet new demand at a modest pace – and despite several months of falls in the growth of recruitment, the jobs market remains in marginal expansion. Short term seasonality problems aside, it is clear that managers expect double digit GDP growth to resume. "Sales Managers have told us that the weakened Tugrik is still causing widespread inflationary problems, with petrol prices in particular rising rapidly. Market indexes have begun to decline. This is in part due to very harsh weather conditions in February which saw temperatures descend as far as -40 degrees. This has meant the key manufacturing industries have had to slow down or stop work altogether. Panelists seem confident that strong GDP growth will resume in 2014 despite short term seasonal challenges." Mogi: watch out for some drastic measures from GoM to control the currency. February 26 (infomongolia.com) On Tuesday, February 25, members of the National Security Council of Mongolia led by its Chairman O.Ochirjav held an irregular meeting. In his brief statement, Chairman O.Ochirjav said, "During the working meeting, members discussed the current socio-economic situation in the country. The Prime Minister N.Altankhuyag will report about economic states to political groups in the State Great Khural (Parliament)". Ulaanbaatar, February 26 (MONTSAME) The parliamentary Standing committee on budget is planning to held an open meeting early March. The meeting will discuss results of audit inspections conducted on 234 frozen construction projects, as well as amendments to the 2014 government budget. After thoroughly discussing these projects, the meeting will decide whether to continue their investments. If the members consider ceasing the money, the underdone buildings might be sold at auctions. SkyPath Partners LLC ("SkyPath"), the Mongolia focused advisory and principal investing firm, is pleased to announce the appointment of Cameron McRae as Executive Chairman, with immediate effect. In addition to his board responsibilities, Cameron will oversee the strategic direction of SkyPath and participate in the financial advisory, strategic consulting and principal investment activities of the firm. He will remain based in Ulaanbaatar. Cameron has more than 30 years of mining experience, gained across six countries. Lastly, he was President and CEO of Oyu Tolgoi LLC ("Oyu Tolgoi") and Rio Tinto's Country Director for Mongolia, between 2010 and October 2013, based in Ulaanbaatar. Cameron led the construction and commission of the open pit mine and concentrator of Oyu Tolgoi, Mongolia's largest mine. The project was completed ahead of schedule and on budget, setting new national standards in health, safety & environment; business development; training and corporate social responsibility. Previously Cameron held various leadership positions at Rio Tinto's Energy, Copper, Diamonds and Industrial Minerals' units, including Managing Director of Richards Bay Minerals in South Africa and Murowa Diamonds in Zimbabwe, as well as at the corporate level. He established Rio Tinto Energy's presence in China and led the strategic review of Rio Tinto's approach to Africa in 2010. At the corporate level, Cameron was a leading team member in the landmark merger of RTZ plc and CRA Ltd that created Rio Tinto and worked on other successful M&A transactions. The resources sector is the single largest industry in Mongolia, with an estimated annual revenue of 1.4 trillion MNT (approximately US$ 798.9 million) in 2014*, and the majority of the country is still unexplored. "Cameron is the most high profile international business executive in Mongolia today, and we are delighted to welcome him to SkyPath," said Alex T. Kim, CEO of SkyPath Partners. "With his exceptional record of leadership in large organizations, and experience in developing and managing major mining projects, financings and transactions, Cameron's contribution to the firm will be transformative. Cameron's global network, management acumen, and wealth of experience in the mining industry in both commercial, transactional and operations capacities bring significant depth to our management team. His engagement will add real value for our clients and investments, particularly in the resources sector, which is an essential element to the growth and development of Mongolia." Cameron McRae said: "There is clear demand for a Mongolia-focused advisory and investment specialist that can facilitate and accelerate capital flows into Mongolia. The opportunities and challenges in Mongolia are like no other country in the world and there is no substitute for firsthand experience. I am very excited to be working with Alex T. Kim, the impressive SkyPath team, its shareholders and partners, to serve domestic businesses and international investors in Mongolia. This is an exciting opportunity to join an entrepreneurial company committed to Mongolia's long-term economic development with the vision of bringing together the best Mongolian and international talent, capabilities and resources." SkyPath Partners LLC is a financial advisory, strategic consulting and principal investing firm. Headquartered in Mongolia, the firm is focused on bringing international capital, services and capabilities to Mongolian companies and investing in the growth of the country's economy. SkyPath was created to fill an unmet need for a trusted and capable advisor to help Mongolian firms and government and international companies navigate complex financial and strategic issues by providing a bridge to world-class expertise and capital from international sources. For more information, please visit http://www.skypathpartners.com. By Terrence Edwards, Feb 27 (Reuters) - Rio Tinto's former Mongolian chief and boss of the massive Oyu Tolgoi copper project says the country is taking the right steps to arrest a drop in foreign investment but needs to do more to ease uncertainty for explorers and developers. Four months after parting ways with global miner Rio Tinto, Cameron McRae has joined the advisory board of Toronto-listed explorer Kincora Copper, as it tries to reclaim licenses revoked by the Mongolian government that spawned a C$7 million writedown ($6.3 million). McRae has also been appointed executive chairman of Mongolia-based consulting firm Skypath Partners, which is aiming to help investors navigate Mongolian regulations and raise capital. "There's a lot of money that needs to come into Mongolia and it's not just going to get there by itself. The intermediary role is important," McRae told Reuters. Few would have more experience than McRae in dealing with Mongolian authorities, as he saw multiple disputes unfold while leading the $6.5 billion Oyu Tolgoi project, the biggest foreign investment in Mongolia. Parliament members attempted to amend a 2009 investment agreement between the government and Rio's majority-owned Turquoise Hill, which owns 66 percent of the mine, in 2011 and again in 2012. Disputes over Oyu Tolgoi and broader regulatory uncertainty have deterred other investors looking to build mines in Mongolia and led to a 54 percent drop in foreign direct investment to $2.05 billion in 2013 from a year earlier. Now an outsider to dealings involving Oyu Tolgoi (OT), McRae said Mongolian lawmakers have shown they have learned from mistakes made over the past few years, when the mine investment agreement was regularly attacked in parliament and in the media. "When I arrived in Mongolia, criticizing the OT investment agreement was almost like a political sport," McRae said. "I think the government has certainly recognized the importance of resolving those sorts of issues behind closed doors. I think that's a big step forward." The government owns 34 percent equity in the copper mine, where an open pit operation started exports last year, while construction of an underground mine that could account for 20-30 percent of the economy was put on hold while the owners try to settle disputes. A major hurdle has been a $4 billion project financing package to pay for the underground mine. The finance agreement is due to expire March 31, after having been extended last year by lenders such as the World Bank's International Finance Corporation and European Bank for Reconstruction and Development. "The project finance is also a huge thing for investor confidence," McRae said, as it would be the world's largest project finance, backed by a large consortium of commercial banks and international financial institutions. "And that will effectively put Mongolia on the map." Mogi: too harsh on Montsame? February 26 (Cover Mongolia) Montsame published an article today that was copy-pasted from a Lotte press release dating September 15, 2011 on a deal struck between Mongolyn Alt (MAK) and Lotte Construction, on a $110 million project to build "Hyatt Regency Hotel Mongol". Original announced stated that construction will commence in 2011 and to be completed in September 2014, a date which Montsame also mentions. The building referred to here is what's also being call the MAK Tower, and located on the south-east corner of Peace Bridge. Only the ground has been broken so far with fenced-out with Lotte E&C logos. Ulaanbaatar, February 26 (MONTSAME) The first Mongolian Television Forum (MTF) commenced Wednesday in the "Blue Sky" tower in Ulaanbaatar, themed "Developmental tendencies of world's TV channels". The two-day forum has attracted officials from the world's big TV content suppliers such as Warner Bros., Walt Disney, Sony, Bomanbridge, IMG, ITV, Endemol to have them share experiences and discuss urgent problems facing TV channels in Mongolia. The domestic channels considered ways of making contents of high quality and maintaining principles. A "IPTV and cooperation among TV channels, further tendencies" report will be delivered by G.Bars, a director of the Content Development Planning Service at the Unitel Group. The organizers say the MTF will help our TV channels to expand the relations with foreign counterparts and to receive contents of the world's top channels. Ulaanbaatar, February 26 (MONTSAME) Mongolian designer Ariunaa Suri has been invited to Mercedes Benz Fashion Week in Tokyo which will run March 17-22. Since establishing "Ariunaa Suri" brand based upon the principle of "Mystery of In-Between" in 2011, the designer has urged assimilating the Mongolian nomadic ethic as minimal in western style and reflecting it in the mixed soft hues by the organic fabrics such as wool, cashmere and leather of live stocks from the steppe of wild weather. She has worked as a creative designer in Berlin after her mere study and research for 10 years in Bremen, Germany. The inspiration of the outfits is rooted in Mongolian traditional extraordinary costume's unique pattern, elements and motivation, says the fashion week website. "The punk urban looks of our FW14/15 Collection is mixed with a slight themes, Nomadic Ethic and Western styles by neutral and the intermediate colors in the natural fabrics. The sense of freedom in the collection is inspired by wild nature of Mongolian endless steppes and exotic tradition of non-sedentary nomads," it adds. "Mercedes Benz Fashion Week" is a fashion festival held twice a year in the world's fashion cities during which the trends for the next season are born from the latest collections that are unveiled at fashion shows and exhibitions. Mercedes-Benz Fashion Week Tokyo is hosted by the Japan Fashion Week Organization and held twice a year on March and October. February 26 (Hizmet Movement) Turkish school's alumni in Mongolia have launched the businessmen association Businessmen of the Land of Blue Sky (BASIC). TUSKON's Mongolian partner to be, BASIC had its inauguration at Blue Sky, one of the most luxurious hotels in the capital Ulan Bator. Baatar Tsolman, chairman of the board, said, "With today's opening, we believe our association will grow increasingly to become a global one. We aim to get our members meet the members of our global partners and thus invest in a variety of fields. The event saw a large attendance of the business people. Among them were Turkey's ambassador to Ulan Bator, Turkish businessmen, Azerbaijani investors along with numerous Mongolian businessmen. The guests enjoyed the traditional instrument Morin Huur performance along the dinner. The association's officials introduced their initiatives. Business agreements between the partners followed the peaceful and friendly remarks by foreign and local businessmen. BASIC President Ulambayar Otgon said, "This ceremony introduced our association to the business world. We have TUSKON members and Azerbaijani businessmen too with us tonight. We have signed agreements." Turkish schools' alumni around the world continue to contribute to the global peace. Published [in Turkish] on Samanyolu Haber, 22 February 2014, Saturday. By MICHELLE BOROK, February 21 (UB Post) Every first time visitor to Mongolia is struck by the road conditions and driving norms here. Long term residents learn to adapt to the dangers of driving, being a passenger in a vehicle and navigating the streets as a pedestrian – all equally terrifying endeavors. The Atlantic shared data from a recent report by the University of Michigan's Transportation Research Institute. The study looked at traffic related mortality in 193 countries, and Mongolia ranked 10th for road crash fatalities accounting for 5.5 percent of all causes of death. More than 50 percent of Mongolia's automobile accident fatalities include pedestrians, cyclists and motorcyclists, an unsurprising fact. In 2008, Mongolian lawmakers considered the nearly 1,500 deaths and over 5,000 injuries between 2004 and 2008 as having reached disaster levels. Public education campaigns about the dangers of drunk driving, parent traffic monitors in school zones, and even volunteers painting streets to draw driver attention to pedestrian crossings are admirable citizen-led efforts, but lawmakers and city and province administrators have yet to take serious measures to bring fatality figures down. In 2011, the United Nations launched its "decade for action" on road safety in response to rising fatalities around the world, especially in developing countries. Mongolia's road accident deaths accounted for 6.8 percent of deaths that year. Improving road safety isn't just putting safer cars on the streets, but also revisiting standards for training and licensing of drivers, implementation of laws that call for safer driving (requiring seat belts for drivers and passengers and banning hand-held cellphone use by drivers), consistent enforcement of safe driving laws, improved access to public transportation, urban planning, monitoring of road conditions and emergency services. All of these issues pose challenges to Mongolia. As Prime Minister N.Altankhuyag makes headway in building major roadways connecting the provinces to the capital, Mongolia will have even more kilometers of roadway to keep safe. Beyond the boundaries of Mongolia's cities and more densely populated soums, street lighting, speed bumps and traffic policing are non-existent. The building of these new roads are part of the national development plan to minimize rural migration into the already overcrowded capital, and thereby minimizing Ulaanbaatar's traffic congestion, but they also represent more opportunities for blood on the highway. D. Batbaatar, Head of Road, Traffic Strategy Implementation Department at the Ministry of Roads and Transportation spoke with The UB Post last January about efforts to ban the continued import of vehicles with right-hand drive steering wheels. With Mongolian roads designed with left hand drivers in mind, the proposal isn't an unreasonable one. At the time of the interview, D.Batbaatar said that the initiative was in its research phase, conducting interviews and feasibility surveys. One year later, importers continue to import both left and right hand drive vehicles and the recent ground breaking ceremony of a Mongolian Toyota retailer raises the question of which drive system will eventually be imported. For now, dangerous left hand vehicle passing on city and province roads will continue to be made by right hand side drivers leaning across passenger seats and vaulting into oncoming traffic. Ten new buses were just added to Darkhan's public transportation system, to the misfortune of unofficial "taxi" drivers, but the immediate benefit of fewer cars on the road and an affordable option for residents. The fare is 300 MNT for adults and 200 MNT for children. But meanwhile, in Ulaanbaatar, with considerably greater demand for public transportation, bus fares have risen and passengers are still left waiting for more buses and improved services. Investment in improved public transportation services is crucial to building a healthier, smarter, and safer Ulaanbaatar. Cement blocks sporadically indicate bus lanes, but private microbuses and impatient commuters still dart in and out of them. Faded traffic lanes seem to simply be another suggestion for drivers. Even in the capital, off-road driving rules still seem to apply – forge your own path to get where you're going and try not to get stuck. Better yet, try not to get anyone killed. Mongolia's lawmakers, urban planners, and citizens have the bumpiest of rides ahead to make their roads safer. High-Level Forum on "Climate Change and Food Security in Landlocked Developing Countries and Small Island Developing States in Asia and the Pacific Region" to be held in Ulaanbaatar. February 25 (ITT for LLDCs) Ministry of Industry and Agriculture of Mongolia, The Food and Agriculture Organization of the United Nations and the International Think Tank for Landlocked Developing Countries will jointly convene a one-day high-level forum on March 12th 2014, in Ulaanbaatar, Mongolia consecutively with the 32nd Session of the FAO Regional Conference for Asia and the Pacific. Hosted by the Government of Mongolia, the forum will assemble about 30 participants including ministers and high-level delegates from LLDCs and SIDS of the Asia-Pacific Region, other UN and International Agencies, regional development partners as well as nongovernmental organizations. The high-level forum will cover issues such as climate change and food security of the respective region and therefore it will engage participants in interactive discussions and solicit their advice. Based on the objective to address food security and poverty reduction in the face of climate change, with special reference to LLDCs and SIDS in the Asia-Pacific region, the forum is expecting to reach the outputs such as knowledge sharing and exchange of experience on the impact of climate change on food security in the respective countries, successful climate change adaptation and mitigation interventions for ensuring food security identified and discussed, effective policy options and actions that would be taken to minimize the negative impacts of climate change and enhance food security identified and agreed, and a key recommendations to reduce the negative impacts of climate change on food security in LLDCs and SIDS in Asia and the Pacific Region discussed and agreed. What: High level forum on "Climate change and Food security in the LLDCs and SIDSs in the Asia-Pacific region"
February 25 (GOV.UK) By 31 March, the UK visa application centre in Ulaanbaatar will move to new premises and customers will be required to pay an additional fee to use the service. The move follows a global review and restructure of UK Visas and Immigration services to increase the number of visa application points and improve services globally, through commercial partner contracts. The new visa application centre will be run by UK Visas and Immigration's commercial partner, VFS Global, who already successfully operate UK visa application centres in most countries across Asia Pacific. The new service will provide customers access to extended opening hours and a variety of value added services such as translation, photocopying and a courier service. The fee to use the visa application centre will be £59 ($USD100). This will be in addition to the visa fee and will be charged at the point of booking the appointment and will cover the cost of providing the application submission facilities in Mongolia. Appointments at this Visa Application Centre will not be honoured if this fee is not paid. The centre will be open from 9:00am to 3:00pm Monday to Friday, offering increased availability over the current service. We will work closely with VFS Global to ensure continuity of service during the transition period. Applications will continue to be assessed by UKV&I staff and there will be no change to our standard processing times. To further improve efficiency, the decision making of applications received in Mongolia will move from Beijing to our high performing visa hub at the British Embassy in Manila. This move will cut courier transit times by 1 day (1 day quicker on return), reducing the end to end processing time for Mongolian applicants. With increased pressures on the China operation, the move to Manila will also ensure applicants continue to receive their visa decisions within our target processing times. From April 1, customers in Mongolia will also have access to a new global contact centre for visa enquiries. This will be operated by Hinduja Global Services from their contact centres in the United Kingdom and be available during Mongolian working hours. This will replace the current limited enquiry service and offer a range of enquiry options including a free recorded service, a premium call service for those who wish to speak with a customer service officer, a web-chat service and a free email enquiry service. Further information and contact details of the new contact centre will be made available in due course. Further information on changes to our global visa service are on the UK Visas and Immigration website and information on the new visa application centre and added value services will be available on the new VFS Mongolia visa application centre website in March. BLOOMINGTON, Ind., February 20 (Indiana University Bloomington) -- Bulgaa Altangerel, Mongolia's ambassador to the United States, will visit Indiana University Bloomington on Monday, Feb. 24, and present a free, public lecture. Altangerel will speak on the topic "Socio-Economic Development of Mongolia, Past and Present" at 5:30 p.m. in the Bridgwaters Lounge of the Neal-Marshall Black Culture Center, 275 N. Jordan Ave. The Mongolia Society, the Inner Asian and Uralic National Resource Center, the Department of Central Eurasian Studies and the Neal-Marshall Black Culture Center are hosting his visit. Altangerel has a master's degree in international law and political science and a Ph.D. in international law from Kiev National Taras Shevchenko University in Ukraine. He has been his nation's ambassador to the United States since January and also is the nonresident ambassador to Israel and Mexico. He also has served as Mongolia's ambassador to Turkey, the United Kingdom, South Africa, Ireland and Iceland. He represented his country's interests with Bulgaria, Lebanon, Romania and Uzbekistan. IU is considered one of the world's leading centers of academic expertise in Mongolian studies, and IU's Department of Central Eurasian Studies in the School of Global and International Studies is the sole independent, degree-granting academic unit in the U.S. staffed with its own faculty of specialists in the region. Last year, IU's Kelley School of Business entered into a partnership with the newly formed American University of Mongolia to offer graduate programs. Visitor parking is available in the Jordan Parking Garage, across the street from the center. February 26 (news.mn) An individual was arrested at Zamin-Uud border check-point for suspected smuggling of historically and culturally valued antiques and religious items. The Border Intelligence Division staff stopped a Mongolian woman in the attempted to smuggle religious antique idols including brass and clay Buddhist sculptures, a horn, bell, oil lamp, a sacred instrument used in Buddhist ceremonies, and Bronze Age knife. Also discovered were antique items including Mongolian men's accessories that attach to the belt such as a silver embossed knife, fire starter, chopsticks, Mongolian long-pipe with a precious nephrite stone mouthpiece, double hand carved nephrite snuff bottle, and even a piece of meteor. After they investigate into the antique dealers in Mongolia, it was revealed that a Chinese national was behind the attempt to smuggle these items from Mongolia with the help of a Mongolian woman. The antique dealers, who obtained the historically and culturally valued items in Mongolia illegally, are believed to sell on the goods to antiques shops in Erlian, the border city with China, where almost 80 percent of the goods are from Mongolia. The value and price of the antique items are unknown according to the Customs officials. According to information obtained by the Borders Intelligence Division antique smuggling has become more complicated and more organized. In this case the smuggled antique items were checked and stamped by the Customs officials. Therefore the Criminal Police Department suspects that Customs officials may be involved in the case. The antiques and religious items will be discussed at the Board meeting whether they need to be appraised and will then to be delivered to museums. Ulaanbaatar, February 26 (MONTSAME) A ceremony took place Wednesday to grant our athlete and officials the outfits for Sochi 2014 Winter Paralympics that will take place March 7-16. Our country will be represented by one athlete B.Ganbold who will compete in the men's cross-country skiing event. He is coached by Dashdondog. The outfits were designed by the "Gobi" company. As we informed before, the outfits for Mongolians athletes were selected as one of the most stylish at the Sochi Games by the latinopost.com website. Ulaanbaatar, February 26 (MONTSAME) Mongolia will work out and realize a specific policy and plan for developing winter sports, and this was considered on Wednesday at a meeting between the Ministry of Culture, Sport and Tourism and authorities of Mongolian federations of winter sports. The Ministry and speed skating, skiing, curling and bandy Federations agreed that the winter sports are not developing in Mongolia due to lack of buildings, material base and professionals, and discussed possibilities of erecting an indoor house of winter sports. Noting that huge money is needed for a big winter sports house, the sides expressed a confidence that they can develop the winter sports and host international competitions, "besides, winter sports athletes number will rise". The Federations considered as necessity to construct an indoor house for ice-hockey that is used throughout four seasons, is less expensive, and can be exploited for figure-skating, short-track speed and curling. Outdoor sports such as skiing and speed skating can be developed in the "Khandgait" camp, they added. Apart from the material base, the Federations should be provided with experts and techniques, "it is very hard to hire foreign professionals because we do not have training facilities and fields". The Ministry said the President of Mongolia intends to convey to the cabinet soon a document on policy of developing the winter sports. KUALA LUMPUR, February 21 (The Star) Mongolia may not be a powerhouses in gymnastics, but with the sport growing in popularity in the country that may just change in the years to come. Khaliun Batbold, a former international and now coach of the national team, revealed that back home in Mongolia, girls are starting to pick up gymnastics as young as four or five years old. "There are so many gymnasts in Mongolia. The sport is really popular. It's very good for us. Hopefully, one day we will a have a top gymnast in the world," said Batbold. To gain experience and exposure, the Mongolians have sent four gymnasts – Ariunsuvd Javkhlantuya, Uuganbayar Baatarzorig, Shurentsetseg Batdelger and Undram Khashbat – to compete in the ongoing Junior Asian Championships. Batbold hopes her gymnasts will gain from their time in Malaysia. Only two gymnasts – Batdelger, 15, and 13-year-old Khashbat – are competing in all four apparatus events (ball, clubs, hoop and ribbon). Baatazorig, 14, is competing in three events (ball, clubs and ribbon) while 13-year-old Javkhlantuya is entered only for the hoop event. The vast Mongol Empire created by Genghis Khan in the 13th century is certainly well-known. But Mongolia's much longer links with the famous Silk Road are often overlooked or ignored by historians. Despite its seeming remoteness and cultural differences, Mongolia has links with the 6500 kilometer-long trading route linking East and West dating back to the first millennium BC. Mongolian expert Carl Robinson, author ofMongolia: Nomad Empire of Eternal Blue Sky, will discuss the origin and history of those connections in the many centuries before the Mongol Empire inaugurated the golden age of trade known as Pax Mongolica when, as a Turkic historian describes, "a young virgin with a tray of gold on her head" could travel unmolested from the Pacific to the Mediterranean and the first Europeans, including Marco Polo, made their way eastwards. The lecture will be complemented by musical performances by Khusugtun, a group of Mongolian musicians who will introduce traditional music passed down from their nomadic ancestors, and renowned "long song" singer Tsogtsaikhan Sosorburam. Khusugtun or "nomads," is a distinctive group of Mongolian musicians whose goal is to share with the world its heritage and culture from thousands of years. They will introduce the nation's unique throat singing and traditional music which have been passed down from their nomadic herder ancestors from the beautiful Mongolian Steppes. The group has received numerous accolades including the Grand Prix at the "Mongolian Hoomii" International Symposium and Festival in Ulaanbaatar, Mongolia and the Gold Medal for A capella, Delphic III International Cultural Olympics, Jeju, Korea. They were also voted BBC radio "World Routes'" favorite group and performance in 2010, and performed at the Royal Albert Hall, London in 2011. Tsogtsaikhan Sosorburam is a renowned "long song" singer. A central element of the traditional music of Mongolia, the "long song" genre is so called because each syllable of text is extended for a long duration. A four-minute song may only consist of ten words. UNESCO declared the Mongolian Long Song one of the Masterpieces of the Oral and Intangible Heritage of Humanity in 2005. Born in Dund Gobi province, she studied long song singing at the Culture and Art University and received her masters degree in folk art from there. She has had numerous solo and joint performances including her "Harmony of Hearts" country tour and "Under the Sun of Graceful Universe" solo concert. Carl Robinson has lived an extremely nomadic life. He grew up in the Belgian Congo and then, starting with a year as an exchange student at the Chinese University of Hong Kong in 1963, spent a dozen years in Asia, mostly in war-time South Vietnam as an aid worker and then correspondent with the wire service The Associated Press, escaping Saigon just before its fall in April 1975. After a couple years in New York, Robinson moved permanently to Australia, where he was Newsweekcorrespondent through the 1980s, wrote a much-acclaimed guide to Australia, operated a highly-successful Vietnamese restaurant, worked as media manager for the 2000 Sydney Olympics and was a consultant on the film The Quiet American. By Makiko Kitamura, February 14 (Bloomberg News) Scientists have mapped the genetic legacy of events of the past 4,000 years that have shaped populations, such as Genghis Khan's expansion of the Mongol Empire, creating an atlas that extends our understanding of human health and history. The atlas uses genetic data on 95 different populations to confirm known historical interactions between peoples and shows the impact of European colonialism, the Arab slave trade, the Mongol Empire, and trade near the Silk Road. The study, led by scientists at University College London and Oxford University, is published today in the journal Science. When comparing a sample of DNA from one of the groups against other populations' DNA, matching sequences indicate shared ancestry. The longer the uninterrupted matched DNA sequence, the more recent the occurrence of intermingling, said Garrett Hellenthal, lead author and research fellow at the UCL Genetics Institute. Shorter matches indicate that the mixing occurred in earlier periods, allowing the team to estimate when the interaction occurred, he said. "It's surprising that some of these signals are so clear, and that they happen in so many groups," Hellenthal said in a phone interview. "Some 80 percent or more of our sample can be looked at as products of mixtures between two or more genetically distinguishable groups." For example, historical records suggesting that the Hazara people of Pakistan are partially descended from Mongol warriors were corroborated by evidence from the study showing that DNA entered the population during the period of the Mongol empire. Conversely, analysis of the DNA of the Kalash people, also in Pakistan, show no evidence of mixing with the Mongols, lending support to the understanding that the region was bypassed by the invaders because of its isolated, mountainous geography, Hellenthal said. Some members of the Kalash community believe they're instead descended from Alexander the Great's army, and the analysis didn't contradict this assertion, given DNA matches with groups in northern and eastern Europe, he said. While providing fresh insight into historical events, the new research may also have implications for understanding how DNA affects health and disease in different populations. Some populations are more at risk of certain diseases than others, and drug efficacy can also vary. "Understanding well the genetic similarities and differences between human populations is key for public health," said Simon Myers, a lecturer in bioinformatics at Oxford University and senior author of the study. Future research may involve more detailed sequencing to spot rare genetic mutations linked with certain populations and diseases, Myers said. The research was funded by Oxford University, the U.S. National Institutes of Health, the Wellcome Trust, the Biotechnology and Biological Sciences Research Council and the Royal Society. February 24 (BBC) It started with just one oversized vodka shot, which seemed harmless enough. But then came another, followed by a third and a fourth. Soon we were all laughing – although at what, I couldn't tell you. With no common language, we laughed and drank until the early hours of morning and then collapsed, exhausted but happy, onto the floor to sleep. Although we visited the capital Ulaanbaatar and the historic and majestic Amarbayasgalant Monastery, one of Mongolia's largest Buddhist monastic centres, most of the extended stops were natural sights, including vast savannahs, mammoth snow-capped mountains and the unusual sandy-grassy Khongo Khan (also known as the Little Gobi Desert).